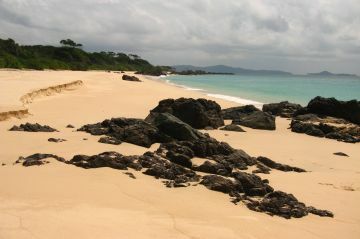 Landscape: White sand beaches, forested hills, clear water. Language: Although Hindi, Bengali and Tamil are the predominant languages, English is widely spoken. Cost of a meal: About $2-4 (Exchange in 2011: Rs45/$1). There are many small vegetarian and non-veg restaurants to choose from in Port Blair, and also in the small tourist villages on Havelock. In Nilambur, on the Trunk Road, you can get very simple meals for very little money, or try the street food. Accommodation: From as little as $3 to resort prices. Camping is not permitted. First, be aware that non-Indian nationals are not allowed to visit the Nicobar Islands, so don't get your hopes up. Most tourist arrive in Port Blair from Chennai or Calcutta, either by ferry (several days journey) or by air. The cost by air is about the same as for a cabin on a ferry. If you want to rough it and can organize comfort on a deck, you can travel for less with a deck ticket. Upon arrival you'll be issued with a Restricted Areas Permit, outlining where you can go and where you can't. It's a bit difficult to decipher, so it's best to clear up any confusion at the Foreigners' Registration Office in town or at the Chief Wildlife Warden's office (from which you can get permits to visit the Mahatma Gandhi National marine park, and other restricted areas). From Port Blair you can visit several other islands nearby: Havelock and Neil being the most popular where there are small backpacker-type restaurants and accommodations. You can also ferry to Long Island, Rangat, Mayabunder, and all the way to Diglipur in the far north. There is long-haul ferry service to Hut Bay on Little Andaman, the farthest south you can go as a non-Indian. 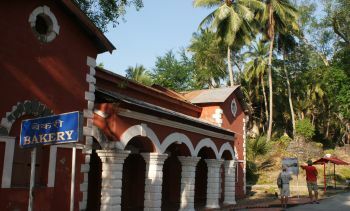 You can also travel by local bus up the Andaman Trunk Road to Diglipur in the far north. There are many off-limits native lands where you are not allowed. 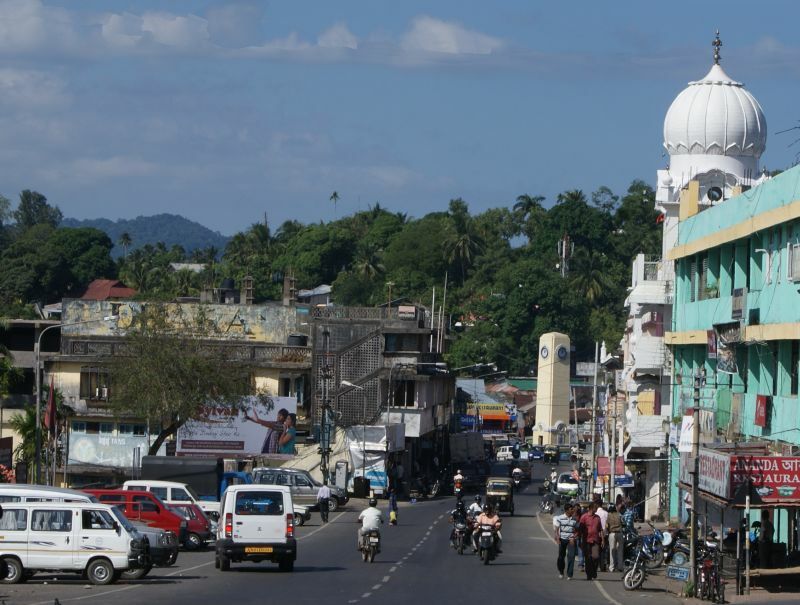 One of the main streets of Port Blair, Andaman Is. The Islands: Over 500 islands constitute the Indian state of Andaman and Nicobar Islands, which are geographically closer to Thailand than to India (to which they belong). These isolated islands are home to at least 10 indigenous tribes, some of whom still avoid contact with the modern world. It isn't known when the first settlers came to the islands, but they are of diverse ethnic backgrounds including Mongolian and Negroid/Micronesian. Separated by water, hills and forests, these people have stayed very isolated not only from the modern world, but from each other until only recently. Although dwindling in numbers, these indigenous people still work the land and fish the seas as they have for centuries. The most sensitive group, the Sentinelese on Sentinel Island to the west of the main Andaman chain, still might greet Indian visiting bureaucrats with bows and arrows. 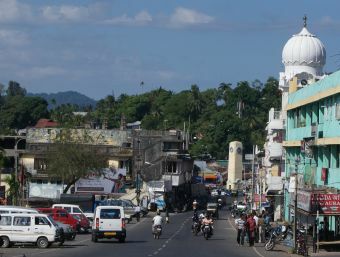 Other tribes are well integrated into modern life, especially those living along the north/south road, the Andaman Trunk Road which joins the capital, Port Blair, with the towns to the north. The largest (and not decreasing in numbers) group are the Nicobarese. If you're lucky you may share a mainland-to-island ferry with a group of Nicobarese, or as one friend did, with a whole school group. An admiral of the Maratha empire based his ships here in the early 18th century and attacked passing European merchant vessels bound to or from other parts of SE Asia. The British had a small colony here in 1789, which they abandoned 7 years later. In the mid-19th century they annexed the islands, as the influence of the British raj spread throughout the rest of India. They established the now infamous prisons in which they incarcerated both common and political prisoners. The Andaman and Nicobar islands were occupied by the Japanese during WWII, probably due to their proximity to the SE Asian mainland from which the Japanese invaded. There was a small resistance group, but in general the people were indifferent to the occupation. The Andaman and Nicobar Islands joined the Indian Union when India got its independence after 1947. 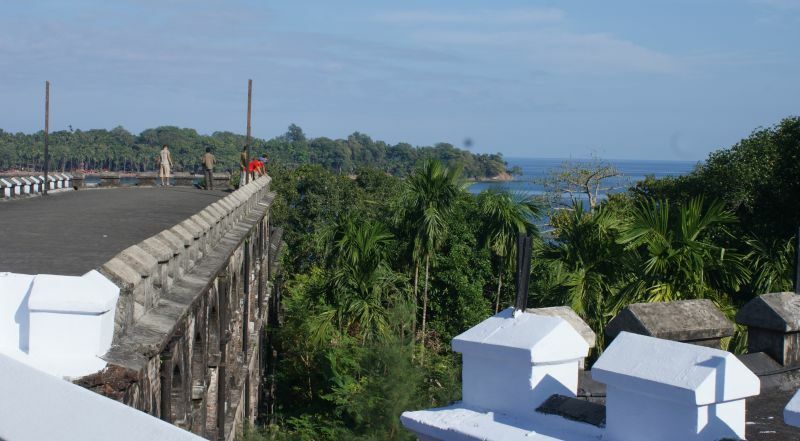 Things to See and Do: Port Blair, the capital, with a population of about 100,000 is a wonderfully spread out, hilly, and water-surrounded town. To walk the streets is, in some ways, like stepping back half a century, with the bustle of pedestrians, tuk-tuks, small trucks, old Ambassador taxis and bicycle rickshaws. From each hill you get a new view of the town and the ocean. Modernity mingles with history: internet cafe's can be found on the same streets as open-air markets, and small shops selling all manor of plastic goods, or fabrics. Temples, mosques and churches can be seen in small streets or atop hills. A good starting point to learn about the history of the islands is the historical Cellular Jail National Memorial, completed in 1908, which served as a general penal colony until the turn of the last century when it became infamous throughout India as "hell on earth", the prison for political dissidents under the British Raj. Many of the Indian independence fighters were imprisoned here, including Mahatma Gandhi. The Anthropological Museum in Port Blair does an excellent job of showcasing the culture of the people of the Andaman and Nicobar islands. Nearby is tiny Ross Island, the administrative site of the British before they moved headquarters to Port Blair. 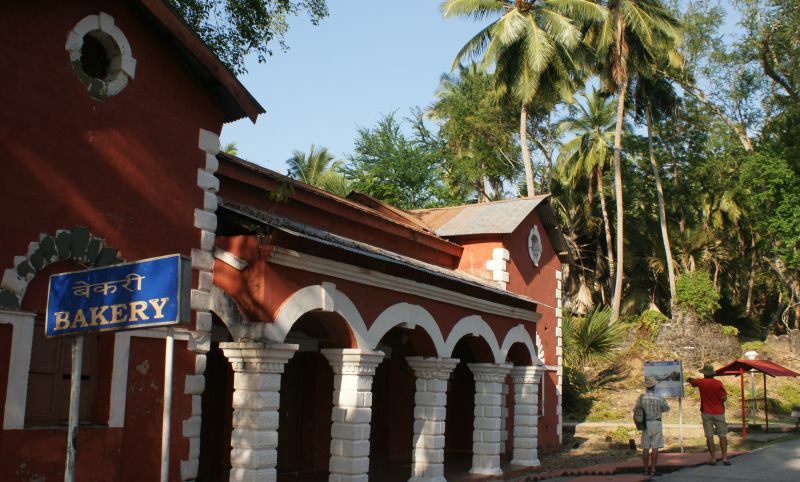 Take a shuttle ferry to the park (entrance fee of a few Rupees) and plan on spending a couple hours walking the shady paths and poking your nose into the crumbling buildings that were once bakeries, offices, and British soldiers' barracks. Trails lead up to viewpoints and old gun emplacements, and past the vine-encrusted ruins of the church. There is a very detailed map of the park on a signboard near the entrance jetty. A herd of chital (spotted) deer have free reign of the grounds, as do a family of lesser whistling ducks. If you seek more exercise, or escape from the noise of Port Blair, you can take the Bamboo Flat Ferry from the Chatham Docks. On the far side you can get a taxi or walk the 7km along the shore and up to Mt. Harriet for some great views. Keep an eye out for large black and white hornbills, shimmering drongos, and bright songbirds in the forest. Snorkeling and diving have long been a draw for the islands. Once renowned for its awesome coral reefs, the islands have suffered twice in recent years -- the 2004 tsunami's epicenter was not far from the Nicobars, and those islands, plus Little Andaman (the southern-most Andaman), were devastated, both on land and sea. Moreover, in April 2010 the ocean temperatures rose to such an extent that much of the beautiful coral of the Andaman Islands was bleached. But it's still worth it to poke your nose below water. 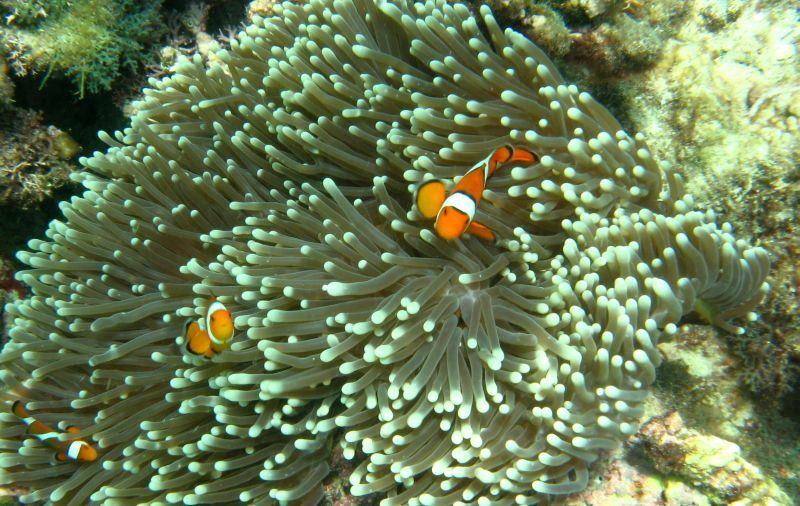 The fish life is awesome: schools of humphead wrasse, each more than a meter long, swim the depleted coral beds, and small clusters of anemones survived the bleaching, and still create wavy homes for the bright orange and white anemone fish. You'll still see schools of big parrotfish (up to half a meter long) munching on the dying coral. There's lots to see, it's just not as colorful as it once was. If you're an optimist, you can take pleasure in spotting the bright come-back growth of young coral taking hold once again. Scuba diving probably offers more variety, as the water would have retained its cooler temperatures better than the shallows. Most of the dive operators are on Havelock Island, but there are branches in Port Blair with whom you can visit the Mahatma Gandhi Marine National Park, or get a boat. To visit the national parks you pay, on top of the dive/snorkel cost, about $20 per person per day. For more information visit our India overview destination page and our Cruising Andamans page, which addresses arriving in the islands by private boat but has some great Google maps of the islands and other general information.